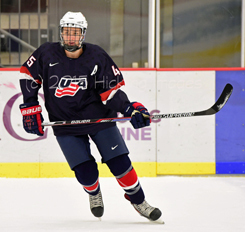 With the U18 Worlds kicking off on Thursday I am going to dedicate the next few blog posts to breaking down the Team USA’s roster. In today’s post let’s take a look at the seven defenseman on the roster…. Note: I am referencing Chris Dilks scouting reports from October when U18’s played back to back weekends against University of Minnesota and Minnesota Duluth. (link to his full write up – SBN College Hockey). #13 Tyler Inamoto, D (6’2 196 lbs) – Inamoto is left shot defenseman from Illinois who is committed to play at Wisconsin. Played Bantam and Midget with Shattuck St. Mary before moving on to play for the USNTDP in 2015-16. This season for the U18’s he had 13 points (2g/11a) in 44 games. He also had 102 penalty minutes. Inamoto is eligible for the 2017 draft and is the 68th ranked North American skater by NHL Central Scouting. #27 David Farrance, D (6’2 196 lbs) – Farrance is left shot defenseman who is a native of Victor, NY and is committed to play at Boston University. In 2013-14 & 2014-15 Farrance played his high school hockey at Victor High and with the Syracuse Jr. Stars U16 club. 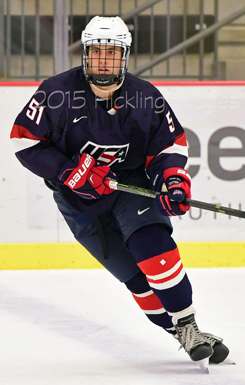 In 2015-16 Farrance was selected to play with the USNTDP. This year with the U18 team he posted 33 points (5g/28a) in 57 games. Farrance is eligible for the 2017 draft and is the 46th ranked North American skater by NHL Central Scouting. #5 Nate Knoepke, D (6’3 201 lbs) – Knoepke is another left shot defenseman on this squad. He is a native of Minnesota and is committed to the University of Minnesota. 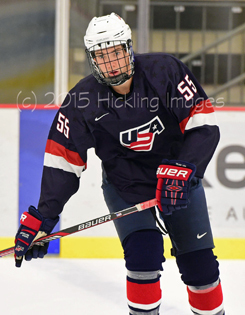 Played a year of high school hockey for Lakeville South High in 2014-15 before moving onto to the USNTDP in 2015-16. This year for the U18 team Knoepke posted 16 points (4g/12a) in 57 games. He is eligible for the 2017 draft and is the 79th ranked skater in North America by NHL Central Scouting. #22 Phil Kemp, D (6’3 201 lbs) – Kemp is a Greenwich, CT native who is committed to play at Yale. Played two years of high school hockey at the Brunswick School before moving onto the USNTDP program in 2015-16. He was captain of the U18 team this year and posted 12 points (5g/7a) in 57 games. Eligible for the 2017 draft and is the 175th ranked skater in North America by NHL Central Scouting. 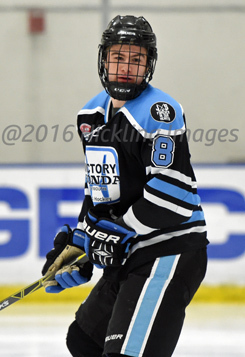 #8 Max Gildon, D (6’3 187 lbs) – Gildon is a left shot defenseman from Plano, Texas and is committed to play for University of New Hampshire. Had originally committed to Wisconsin but decommitted in December. 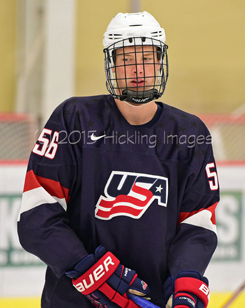 Spent two seasons with the Dallas Stars U16 program prior to coming to the USNTDP program is 2015-16. This season for the U18 team he put up 27 points (7g/20a) in 55 games. Eligible for the 2017 draft and is the 54th ranked skater in North America by NHL Central Scouting. 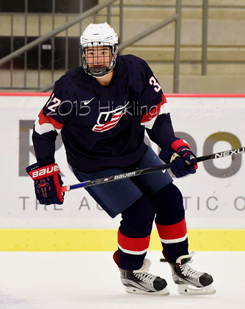 #12 Tommy Miller, D (6’2 176 lbs) – A Michigan native who is committed to play at Michigan State. Played his Bantam and U16 hockey with Compuware before spending two season with Victory Honda U18’s. Came to the USNTDP in 2015-16. This past season with the U18 team he posted 19 points (3g/16a) in 58 games. Eligible for the 2017 draft and is the 81st ranked skater in North America by NHL Central Scouting. Overall this appears to be a solid set of defenseman that the US team has put together. We will see how the pairings shake out as the tournament opener approaches later this week. I will take a look at the Forward group in tomorrow’s blog.